Happy Friday. We have a 3 day weekend. Ella is off today!!! We have a play date planned at the pumpkin patch later also. I am so happy that the weather is finally cooling off. Now since it is officially feeling like Fall I am even more ready for all things fall and crossing things off our Fall Bucket List. 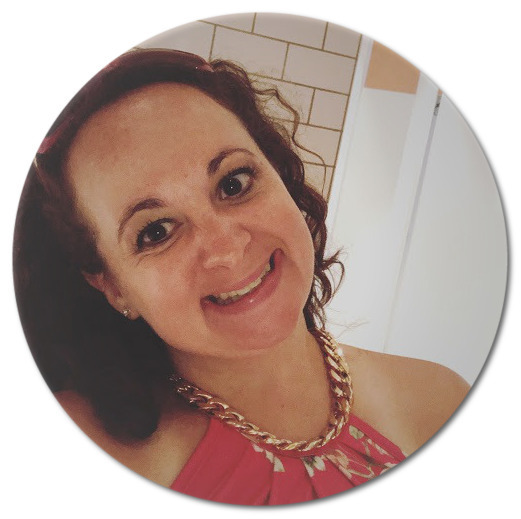 The lovely Nikki over at Kickin' It With Nicks as me to join in on Friday Fall Favorites. I am loving my letter board that I bought off Amazon earlier this year. 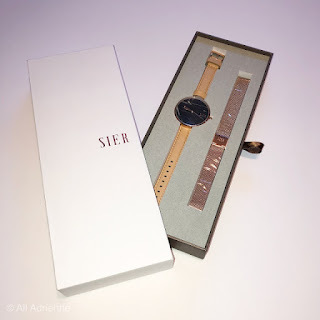 The one I bought is no longer available but HERE is one similar. I have used it for different holidays, parties, and just random days. Austin stole the missing B and I can't seem to find it. The globe I won at a white elephant gift exchange last year at Brian's work. At first I didn't think I was going to like it, but I have come to love it. The witch candle was from the dollar spot at Target. 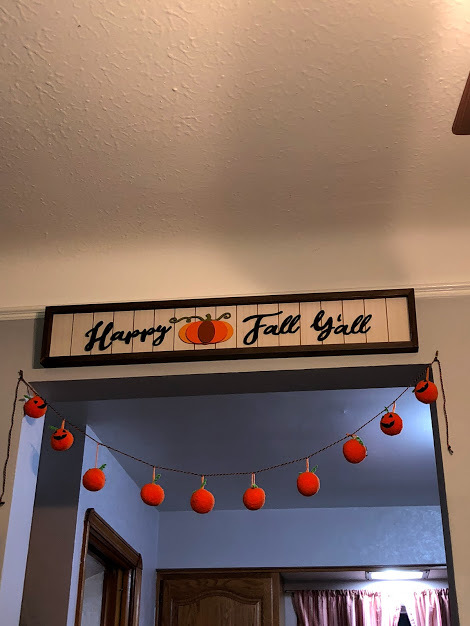 "Happy Fall Y'all" is our new purchase. We bought it from Kirkland's. It was marked 50% then we had another 40% off coupon. 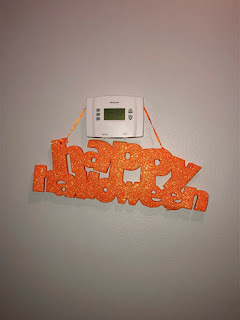 The pumpkin garland was from the Target dollar section last year. 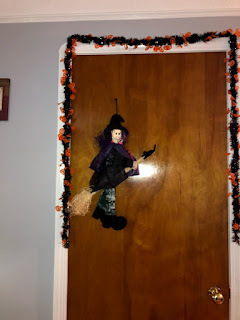 "The Witch Is In" sign is from the the Dollar Tree a few years ago. 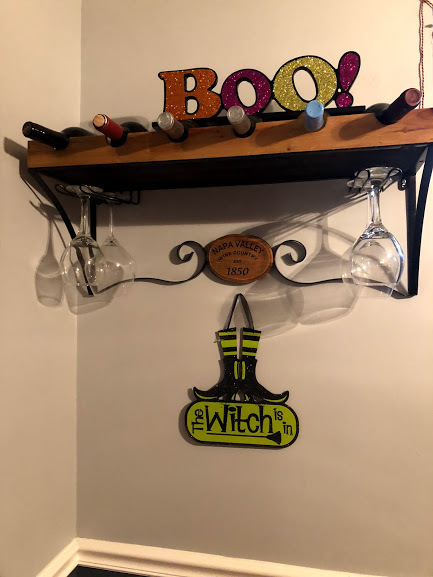 The Boo on top my wine glasses is Walmart gosh probably 10 years ago. Both the flying witch and and pumpkin garland are from the Dollar Tree. 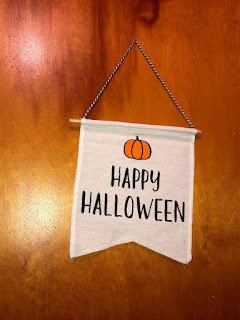 Here is a bunch of mix and match decorations. At the far end (hard to see) is a wooden Halloween house from Goodwill. I don't remember where I got most of the other decorations. If I had to guess they are from Walmart, Target, and Dollar Tree. 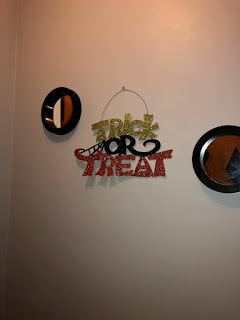 I love this Trick or Treat Sign I got from Kohls a few years ago on clearance. If you know me there has to be Disney somewhere in my decorations. I made this fall wreath. 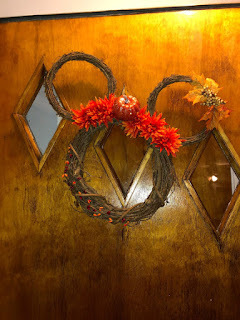 The wicker circles and flowers I got from JoAnn Fabrics. 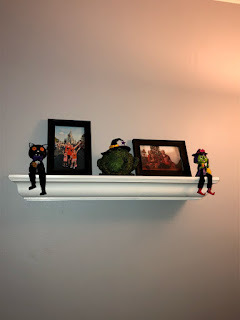 These little shelf sitters are adorable. I found them at the Dollar Tree last year. The frog witch in the middle I have had probably for 15 years when my frog obsession was huge. The ghost is from the Dollar Tree. The frog devil I have had over 10 years also. 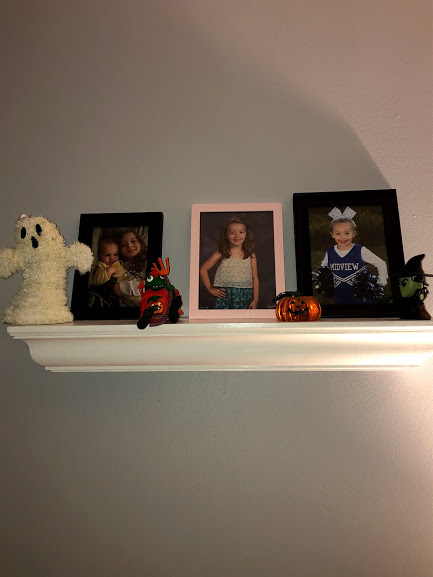 The little glass pumpkin is from Walmart. I have two Happy Halloween signs I bought at JoAnn Fabrics last year on clearance for less than a dollar. 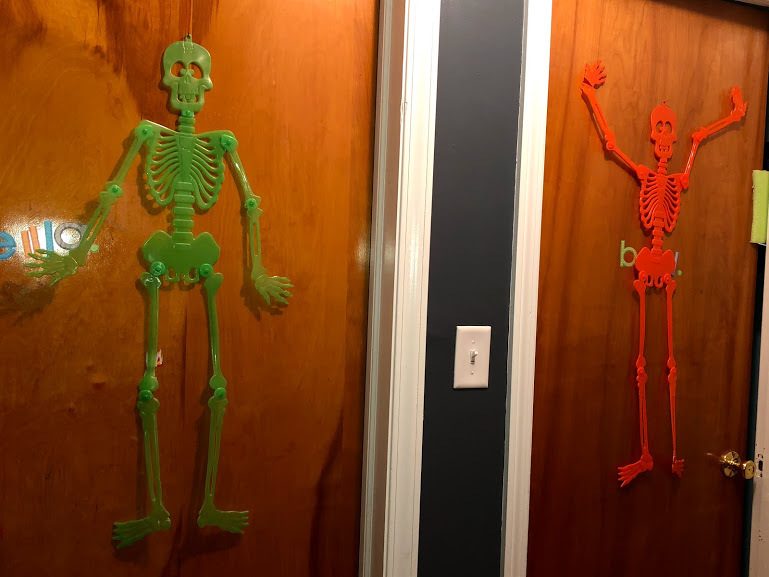 They are hanging on two of the doors in the hallway. Happy Halloween foam glitter is from the Dollar Tree. 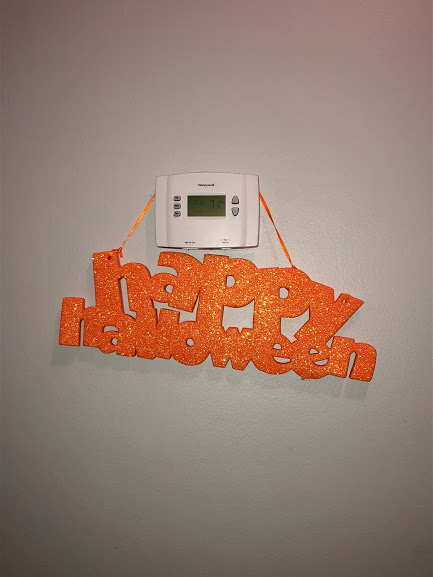 It fit perfect on the bare wall where our thermostat is. 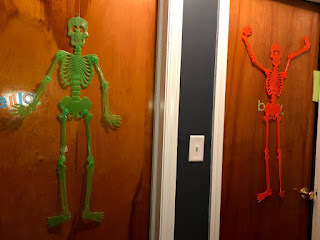 Both kids doors have skeletons from the Dollar Tree. This is my new favorite Halloween mug, well it is my only Halloween mug. I got it when we went to Disney World this past October. It is an exclusive Mickey's Not So Scary Halloween Party merchandise. 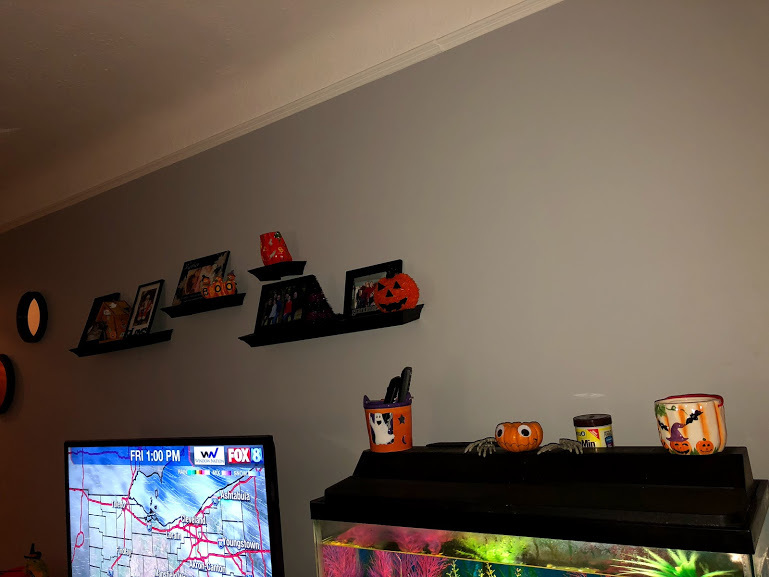 That's all our Halloween decorations for now. 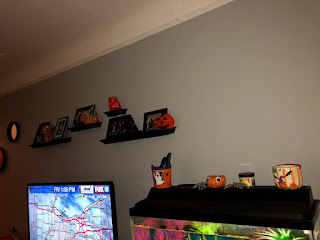 I still need to decorate outside with some pumpkins and odds and ends. 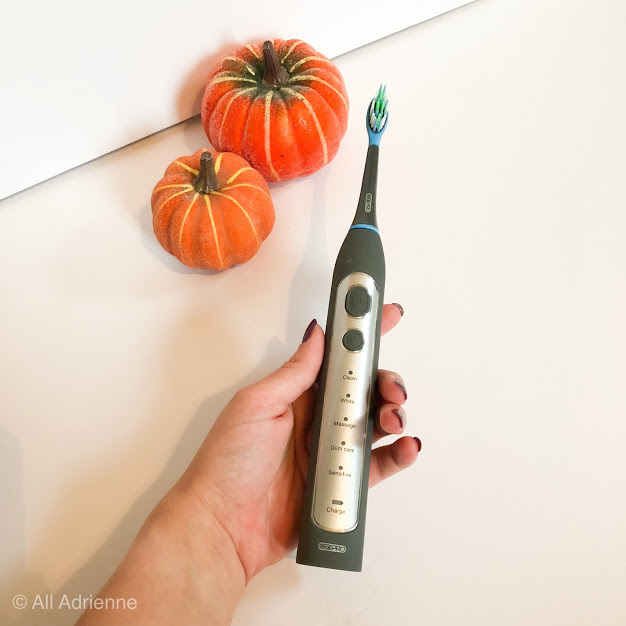 My house may not look Pinterest worthy or out of a magazine, but it is out home (plus we have a little monster who likes to undecorate my house) Check back tomorrow for an amazing giveaway with Smile Brilliant electric toothbrushes. Also linking up with Erika, Narci, and Andrea for Friday Favorites and Katie from Cup of Tea for High Five for Friday!! I LOVE your new "Happy Fall, Y'all" sign that you purchased this year! I'm so glad we teamed up this week, Adrienne! We have similar decoration styles and I love that we both decorate on a budget.